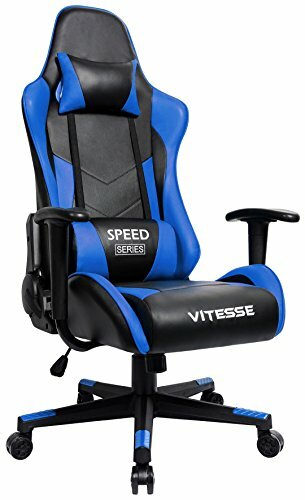 relax and sit comfortably for long sessions of gaming and working. Our computer Chair can extend the full length of the back with support for the shoulders, head, and neck. you will find complete comfort with its Furniture Quality PU leather. Please lean against the backrest during reset,otherwise the backrest may rebound quickly. Waleaf offers you a warranty on parts. contact us and let us know. We will take care of the rest! Big and Wide Padded Seat and Back: Thicker back and deeper bucket seat provide extra comfort for working,studying and gaming. Function: 360 degrees swivel,Adjustable backrest with a 90°－180° safety angle, Class-3 explosion-proof gas lift. Premium rolling casters-keep quiet and no scratches on floor. Ergonomic design gaming/office chair: Three points support on your Head,Spine and lumbar with removable headrest pillow and lumbar cushion. Warranty policy: Free replacement or parts guarantee for any quality problem within 90 days, Satisfaction guaranteed. If you have any questions about this product by Waleaf, contact us by completing and submitting the form below. If you are looking for a specif part number, please include it with your message.